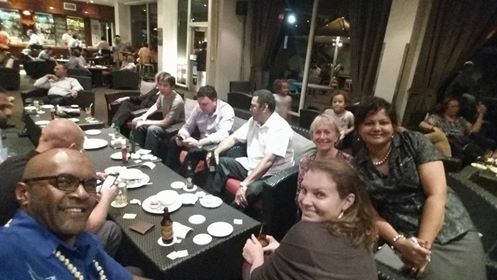 RCSE gathered on Thursday evening to share a few drinks and nibbles, socialise, and buy chances to win DHL Rugby World Cup Merchandise on the eve of the big game. The evening was a great success, with 21 friends and members fundraising $500 for the club. President Shane was able to rake in extra $ selling tickets to other patrons of the Holiday Inn Happy Hour. Members were able to catch up and we hope to welcome a few new members to the fold as well. The club looks forward to making such informal evening meetings a regular habit!